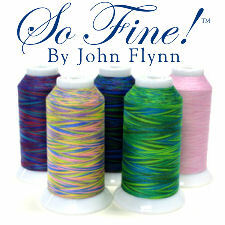 So Fine #40 is 3-ply polyester quilting thread with a 1-inch color-change interval. It's sheen and strength make this quilting thread ideal for any quilting application. The nature of So Fine thread is different from any other polyester thread. The smooth, lint-free processing it goes through is a patented and protected process. This makes So Fine #40 thread the only thread like it in the world.